A quick look at my blog posts for this year revealed something fascinating. I haven't had too many dessert / candy kind of recipes make an appearance this year. I owe that to what used to be a very demanding job. Now that I'm taking some time off, I actually have the time to breathe, to stop and smell the roses, so to say. And one of the first orders of business is to rectify that. I decided that the 2-ingredient Almond Rocks was a good way to start and I needed another rocking recipe. 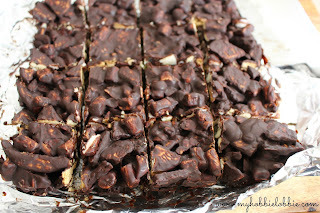 And out of nowhere, I realized I hadn't make any Rocky Road bars in ages. 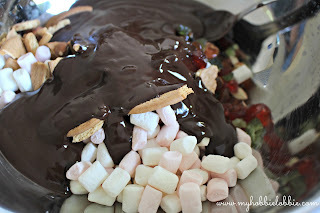 Turns out, I had all the ingredients needed to make some Rocky Road. So with a few minutes of prep and some time to set in the fridge, I now have a delicious batch of Rocky Road. The beauty of this recipe is that you can switch it up so many different ways. You prefer a sweeter chocolate, use milk chocolate. 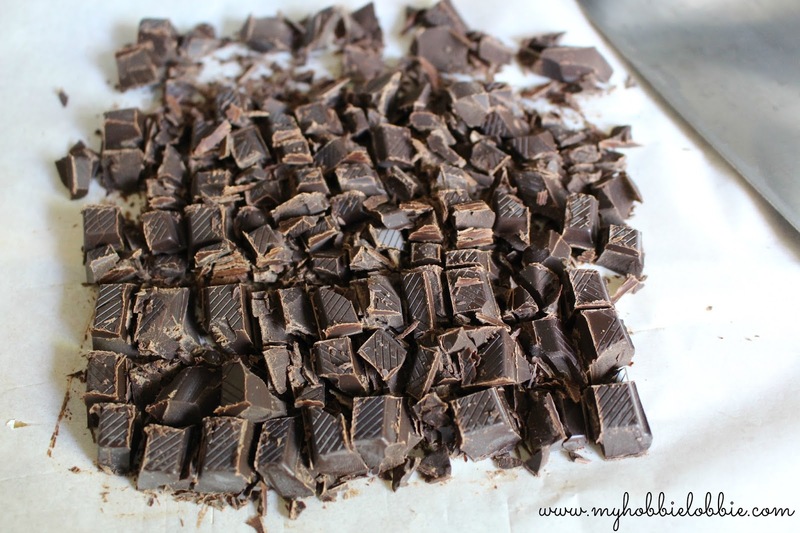 If like me, you prefer a dark chocolate, use a darker variant. I used a 70% dark chocolate. I know to many of you, it may seem like it is a little too dark, but considering the recipe also uses marshmallows, biscuits and glace cherries, it balances out nicely. 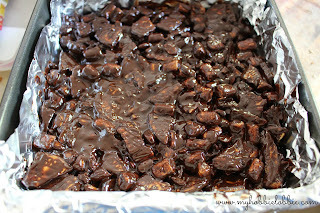 If however you need something in between, use 2 parts dark to 1 part milk chocolate of half of each, to suit your taste. 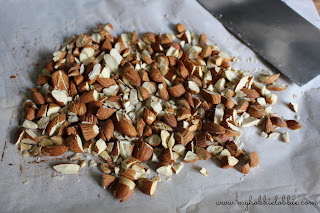 This time around I used almonds but I have also made them with cashew nuts in the past and they work well. I think peanuts would be really nice too. So feel free to switch things up. 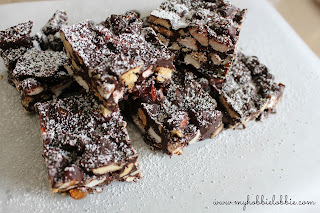 Just before serving these bars, lightly dust them with some icing sugar. I put about a spoonful of icing sugar into a small sieve and lightly tap it over the bars. This gives it a lovely snow-like effect. 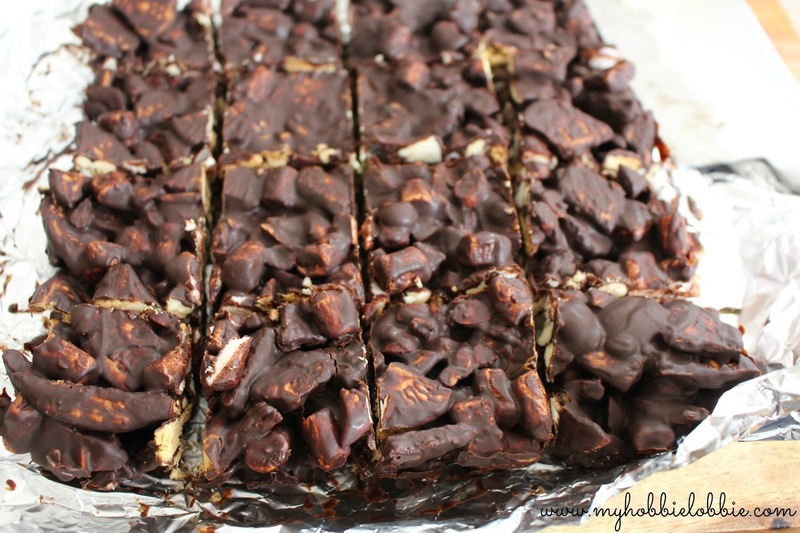 These bars would be perfect to serve up as dessert for your Christmas or Holiday Parties or it could just as well hit the spot as a little treat as well. They would look really good on your Christmas platter too. Roughly chop the chocolate up into little pieces. The smaller the pieces, the quicker it will melt. Place it in a heavy bottomed saucepan with the butter and golden syrup and place it on a low heat. Stir it every now and then to make sure it isn't sticking to the bottom of the pan. When it has mostly melted, stir well and turn off the heat. You will get a silky syrupy consistency like this. 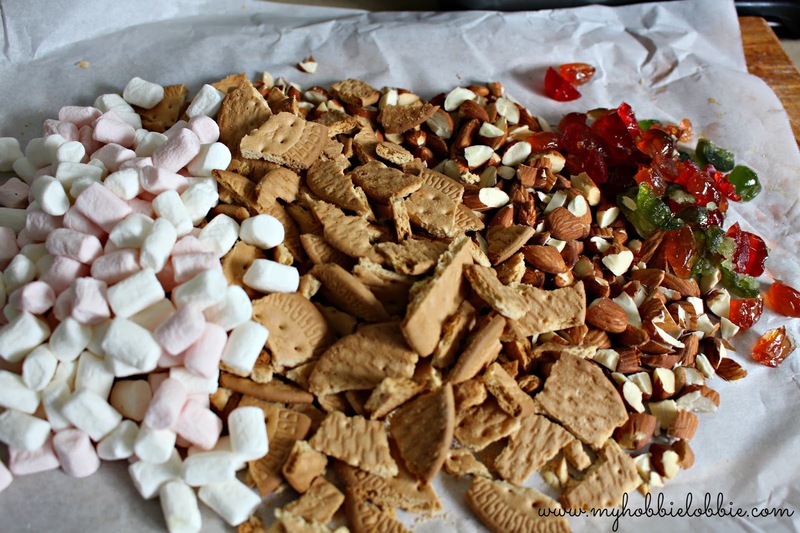 Roughly chop up the almonds and biscuits and set aside. It doesn't need to be uniform in size. 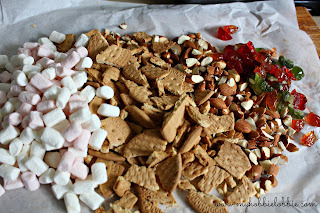 Tip in all the add ins like the marshmallows, biscuits, almonds and cherries into a large mixing bowl. 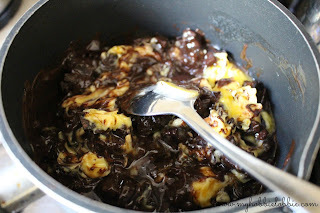 Pour the molten chocolate over the ingredients. Stir well to make sure everything is coated with the chocolate. Line an 8 inch square cake tin with foil. 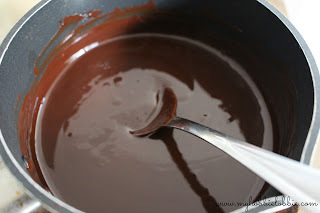 Pour the mix into the lined tin and flatten it out as best as you can using the back of a spoon. When you are ready to cut, carefully peel of the foil. It is easier to do this now rather than after you cut it up. Cut into pieces. I got 16 squares of about 2 inches each. Just before serving, lightly dust with some icing sugar passed through a sieve.